The One Holy Catholic and Apostolic Church from apostolic tradition continues to depict the Icon of the Savior, the Theotokos, the Holy Apostles and all the Saints who pleased God and were glorified by Him, and it teaches and confers the honor and veneration that suits them. "You shall not make for yourself any idol, or any likeness of any thing that is in heaven above, or that is in the earth beneath, or that is in the water under the earth. You shall not venerate them, nor worship them." This commandment prohibits the making and veneration of the idols of false gods, which are made either from the imagination or are similar to created things, whether they be in heaven, on the earth, or under the sea. This commandment is violated by all those who deify creation and worship it through sculptured idols, ending up in idolatry, nature-worship or creation-worship. It is also violated by the worshipers of mammon, who deify matter because it provides them with pleasures and a good life. To this they sacrifice what is most sacred - righteousness, mercy and faith - by offering as a sacrifice every courteous feeling and their whole heart. Violators of this commandment are also those who set up idols in their hearts and with affection worship them, having expelled all their love for God by offering the worship owed to God, to the idols of their hearts. Those who give nature divine properties also violate the Second Commandment, as well as those who deify themselves, believe in themselves, and place their hope in the power of their wealth, namely egoists, the proud, and those like them. The veneration of the Icon of the revealed God, and the Icon of the Mother of God, the Apostles and all the Saints is not at all contrary to the spirit of the Second Commandment. This commandment explicitly forbids idolatry, namely, the worship of false gods, nature-worship and creation-worship, not the veneration of Icons of the true God and the Saints who were glorified by Him. The One Holy Catholic and Apostolic Church, out of love, respect, gratitude and devotion towards the Savior and Redeemer of humanity depicts His face, to express that sacred feeling which floods the hearts of believers; to satisfy this feeling and raise the mind from the Icon to the archetype. The Icon of the Savior Jesus Christ is not an idol of a false god, fashioned with human hands, nor is it a deified statue, nor is it an image from nature or something created in the heavens, on the earth or under the sea, but it is an image of God Himself who was revealed to us, Jehovah God, who gave the law and the commandment: "You shall not make for yourself any idol." We do not offer our worship to the Icon nor do we honor it as God, but we offer veneration of honor towards the archetype. An idol tears us away from worshiping the true God, while Icons of the Savior, the Theotokos and all the Saints not only do not tear us away from the true God, but they lift us up to Him and remind us of the divine compassions in the life and incarnation of the Savior, His salvific passion, the Crucifixion, the Resurrection, the Ascension into Heaven, and in general His entire care for our salvation, urging us to imitate the virtues of the Saints. Icons lead us to the true God instead of distancing us from Him, we who are faithful worshipers of the Lord, and because they are not the idols of false gods nor images of creation that lead us to creation-worship, but sacred Icons of the revealed God. This is why they are not contrary to the commandment, nor can they be considered prohibited to the faithful. The commandment that prohibits creation-worship and nature-worship sought to attach the entire soul, heart and mind to the only true God. We the faithful who depict the Savior Christ and all the Saints who pleased Him from ages past, not only are not distanced from Him, but with all of our soul, heart, mind and strength we love Him and worship Him and hope only in Him, and only Him do we believe in. The veneration of Holy Icons is not only not contrary to the spirit of this commandment, but it fully agrees with it, since it raises the spirit to the only true God. Therefore the veneration of Holy Icons is permitted. "But since some find fault with us for venerating and honoring the image of our Savior and that of our Lady, and those, too, of the rest of the saints and servants of Christ, let them remember that in the beginning God created man after His own image. On what grounds, then, do we show reverence to each other unless because we are made after God's image? For as Basil, that much-versed expounder of divine things, says, the honor given to the image passes over to the prototype. Now a prototype is that which is imaged, from which the derivative is obtained. Why was it that the Mosaic people honored on all hands the tabernacle which bore an image and type of heavenly things, or rather of the whole creation? God indeed said to Moses, 'Look that you make them after their pattern which was showed you on the mount.' The Cherubim, too, which overshadow the mercy seat, are they not the work of men's hands? What, further, is the celebrated temple at Jerusalem? Is it not handmade and fashioned by the skill of men? Moreover the divine Scripture blames those who venerate graven images, but also those who sacrifice to demons. The Greeks sacrificed and the Jews also sacrificed, but the Greeks to demons and the Jews to God. And the sacrifice of the Greeks was rejected and condemned, but the sacrifice of the just was very acceptable to God. For Noah sacrificed, and God smelled a sweet savor, receiving the fragrance of the right choice and goodwill towards Him. And so the graven images of the Greeks, since they were images of deities, were rejected and forbidden. But besides this who can make an imitation of the invisible, incorporeal, uncircumscribed, formless God? Therefore to give form to the Deity is the height of folly and impiety. And hence it is that in the Old Testament the use of images was not common. But after God in His bowels of pity became in truth man for our salvation, not as He was seen by Abraham in the semblance of a man, nor as He was seen by the prophets, but in being truly man, and after He lived upon the earth and dwelt among men, worked miracles, suffered, was crucified, rose again and was taken back to Heaven, since all these things actually took place and were seen by men, they were written for the remembrance and instruction of us who were not alive at that time in order that though we saw not, we may still, hearing and believing, obtain the blessing of the Lord. But seeing that not every one has a knowledge of letters nor time for reading, the Fathers gave their sanction to depicting these events on images as being acts of great heroism, in order that they should form a concise memorial of them. Often, doubtless, when we have not the Lord's passion in mind and see the image of Christ's crucifixion, His saving passion is brought back to remembrance, and we fall down and worship not the material but that which is imaged, just as we do not worship the material of which the Gospels are made, nor the material of the Cross, but that which these typify. For wherein does the Cross, that typifies the Lord, differ from a cross that does not do so? It is just the same also in the case of the Mother of the Lord. For the honor which we give to her is referred to Him Who was made of her incarnate. And similarly also the brave acts of holy men stir us up to be brave and to emulate and imitate their valor and to glorify God. For as we said, the honor that is given to the best of fellow-servants is a proof of goodwill towards our common Lady, and the honor rendered to the image passes over to the prototype. But this is an unwritten tradition, just as is also the worshiping towards the East and the veneration of the Cross, and very many other similar things. A certain tale, too, is told, how that when Abgar was king over the city of the Edessenes, he sent a portrait painter to paint a likeness of the Lord, and when the painter could not paint because of the brightness that shone from His countenance, the Lord Himself put a garment over His own divine and life-giving face and impressed on it an image of Himself and sent this to Abgar, to satisfy thus his desire. 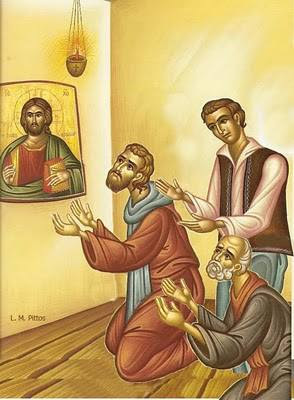 Moreover that the Apostles handed down much that was unwritten, Paul, the Apostle of the Gentiles, tells us in these words: 'Therefore, brethren, stand fast and hold the traditions which you have been taught of us, whether by word or by epistle.' And to the Corinthians he writes, 'Now I praise you, brethren, that you remember me in all things, and keep the traditions as I have delivered them to you.'" From Study of Holy Icons.